Scientists studying one of Scotland's rarest birds say a suppertime snack helps them to successfully raise their chicks. Red billed choughs are restricted to Islay and Colonsay, and the population has been in "serious decline". But researchers from Islay and Aberdeen University say providing young birds with an evening meal of mealworms helps them survive. It's hoped they will go on to breed in future years, boosting the population. 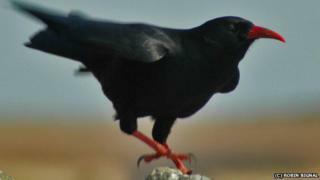 In 1986 there were 95 breeding pairs of choughs on Islay. But by last year that number had fallen to 39. Conservationists from Scottish Natural Heritage (SNH) and the Scottish Chough Study Group observed that most fledglings struggled to survive their first two to three years after leaving the nest. They are now working with local farmers to provide the birds with an extra supply of food before they roost for the night. SNH policy manager Rae McKenzie said: "Islay is now home to a healthy flock of 40 young choughs, something that has been missing from the population in recent years." Eric Bignal, from the study group, explained that, in what he called "the bad years" of 2007, 2008 and 2009, as few as 10% of chicks were surviving their first year. "Assuming everything else stays the same you need survival rates of around 30%", he added. "Since we started the feeding, the rate has crept up - 10% to 20%, then 30% and up to 40%." But what has gone wrong, so the birds need this supplementary feeding? "It's a long story" Mr Bignal said. A story that involves populations falling below a sustainable threshold, a series of bad summers, insect breeding cycles, and changes in farming practices. So a suppertime snack may not be the long-term solution to the choughs' problems. But in the short to medium term the programme should help Islay's population of the birds to remain viable. Mr Bignal said that should ensure these "enigmatic birds retain their rightful place as an important and attractive part of Scotland's bird life."